October is going to be a busy month for me, with my last two exhibitions of 2018. 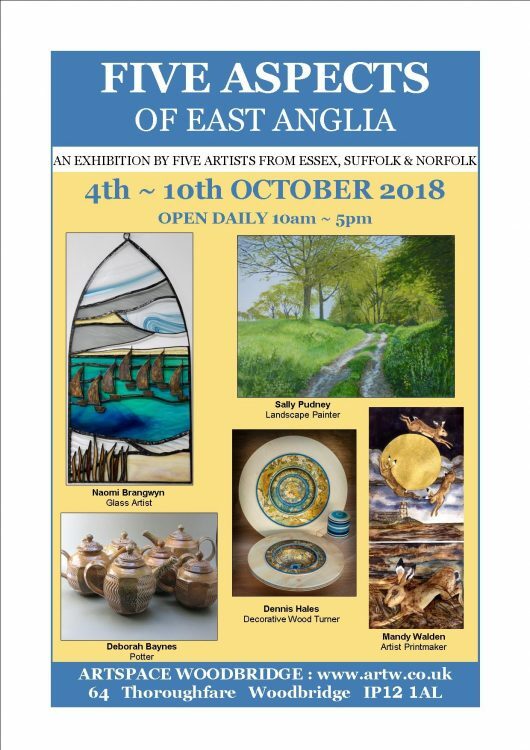 First up is my Five Aspects of East Anglia show at Artspace in the Thoroughfare in Woodbridge, which I am organising with Naomi Brangwyn. We are having a Launch Day on Thursday, 4th October, from 10.00am to 5.00pm, to which you are all warmly invited. On that day all five artists will be there to meet and talk about their work and processes and there will be soft drinks and nibbles available. For the rest of the week Naomi Brangwyn and I will be stewarding every day. It is a ‘buy off the wall’ show, so any purchases that you make can be taken away with you immediately – which I always think is so much nicer than having to wait! I will be hanging 17 paintings, and will also have assorted Greetings cards, including my Essex Wood and Fingringhoe Wick designs, plus my Images of East Anglia 2019 Calendars, and my two little books Twelve Months in an Essex Wood and A Year on Fingringhoe Wick. All the details of opening hours and exact address of the gallery are on the poster above. 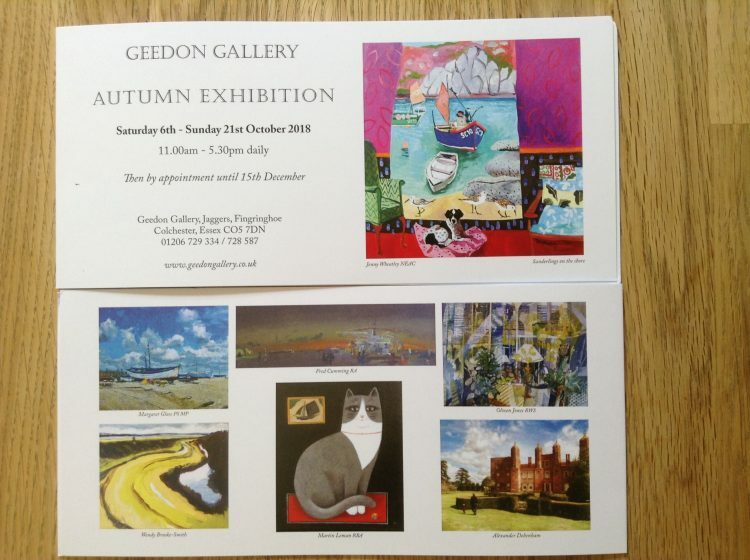 Two days later the Autumn Exhibition at the Geedon Gallery opens, on Saturday, 6th October. I am showing four paintings, two dinghies and two Fingringhoe Wick landscapes. The exhibition is open daily from 11.00am to 5.30pm until 21st October, and then by appointment until 15th December. There is a huge list of other artists taking part, so lots of lovely things to look at if you’re in the area and feel like a little trip out!